For a while I thought Zero was wearing a country-western style shirt in the first panel, with a cowboy vest. Then I saw that he was not. He sort of is — or, at least, he’s wearing some kind of vest over a shirt with a groovy flower type pattern. I’d say the 60s-70s styles that inspire how I dress him have an occasional cowboy/southwestern influence mixed in with the ascots and bell bottoms. I’d rather be hanging out with the Sourballs in the rain, God or no God!! Comfy beds are for losers, hee hee. poor Sourballs I got stuck in St. Louis in the same way but with a cry temper tantrum throwing two year old.truly nothing will convince you of the existence of hell. Oh, man. I imagine the way to dig such a thing even deeper into hell would be if you also had a couple of yappy dogs in the car alongside the kid, and couldn’t find anything on the radio except preachers. PS: Backstage director’s commentary: it’s canon in my mind that one of the members of the occasionally mentioned band Headless Barbies is former Sourball Kim Noxious, and, unlike some of the others, they’re on reasonably good terms with her. Headless Barbies, great name for a band. I’m digging Coco’s t-shirt! Apparently there’s this trend when you order coffee and they ask for your name, to pick the name of a famous person or a silly name. The fun is when your coffee is ready and your name is called out, to see the reaction you get. I was reading a story off Yahoo the other day about celebrity’s alter-ego’s, mainly used for checking into hotels. Y’know what random thing has stuck with me for years? Something I read in the mid-90s about Gwen Stefani checking into hotels under the name “Daria Blue”. I just think it’s a REALLY GOOD fake name! She is a huge fan of proper hygiene and personal cleanliness, and would not dream of accidentally implying more. I kinda want to know what the typeface you used for the “Headless Barbies” logo is called? I always seem to find it in relation to Hole and Babes in Toyland, which is usually a good sign, plus I think it’s pretty. There’s an almost-full-circle thing going on here: it’s based on the 90s Barbie logo, and there was a Hole logo (around 1994, probably the best-known one) that used similar type. There’s a version you can download here — I made a half-assed attempt to figure out what the original typeface was, but couldn’t dig it up. Bonus backstage factz: Band Vs. 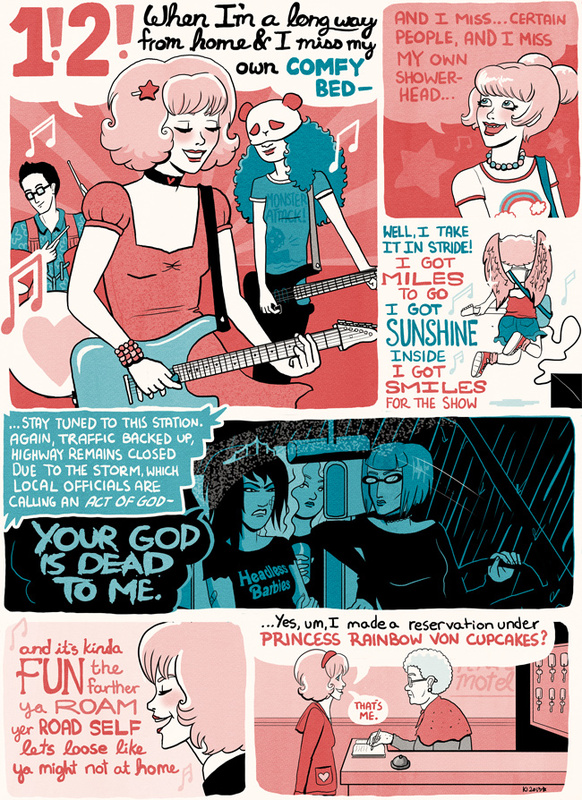 Band has a no fonts rule, so any in-comix text like this that clearly came from a specific font was either traced over by hand or drawn while looking at a font for reference.